The cast of the London 'Alchemy' shows in August 2014 has been confirmed. The shows, that will take place at the off-West End Jermyn Street Theatre (right next to Piccadilly Circus), will be a brand new production of Clive Nolan's musical. Due to a limited space of the theatre (just 70 seats in the venue), the show will feature 8 singers: Clive Nolan (Professor King), Andy Sears (Lord Henry Jagman), Agnieszka Swita (Amelia Darvas), Vctoria Bolley (Eva Bonaduce), Matthew Ronchetti (William Gardelle), Chris Lewis (Thomas Anzeray/Milosh), Verity Smith (Mrs Muncey/Jessamine), Ross Andrews (Benjamin Greaves/Captain Joseph Farrell). On stage we will also see a supporting cast featuring: Ian Baldwin, Ethan Barnett, Natalie Barnett, Colin Greene, Ron Milsom, Caron Morgan and Ollie West. Tickets for the summer off-West End shows are available via the theatre. We have pleasure to announce that the contract with the West End Theatre has been signed! 'Alchemy' will be performed in London in August 2014. Details about the cast, the theatre and tickets sale will be available soon. Clive Nolan: "It is with both pleasure and some trepidation that I can announce that I have now signed the contract with the theatre, and 'Alchemy' is definitely booked to go to the West End. Technically this is an "off West End' show, but geographically we are right there in the heart of it all. We won't name the theatre yet - we'll wait until tickets can actually be bought. Everything for this production begins now, so stand by! So… The adventure continues!!" The Golden Lexicon Award 2013 Goes to Clive Nolan! The long awaited 'Alchemy' shows, which took place in early September at the Cheltenham Playhouse Theatre, proved to be a great success! The Caamora Theatre Company, featuring eleven principal singers, eleven understudies, the band and the chorus, performed four shows in front of the enthusiastic multinational audience. 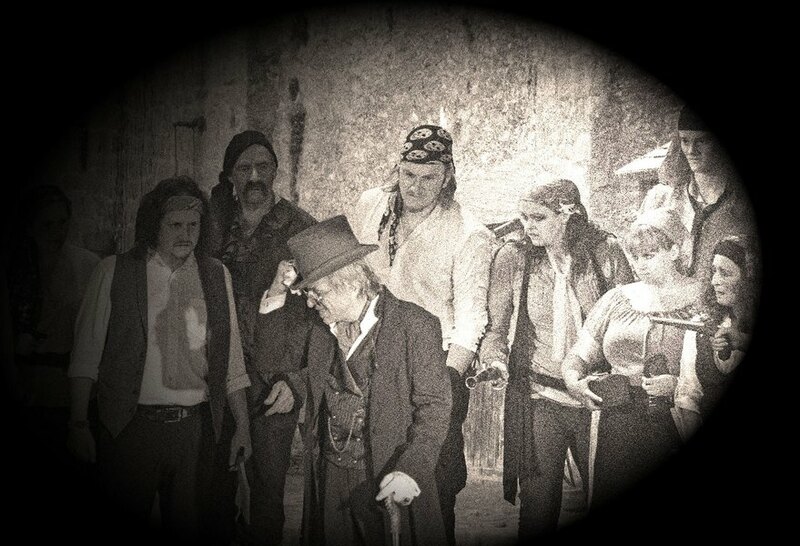 The superb performances from everyone involved brought most positive reactions from press and viewers alike. 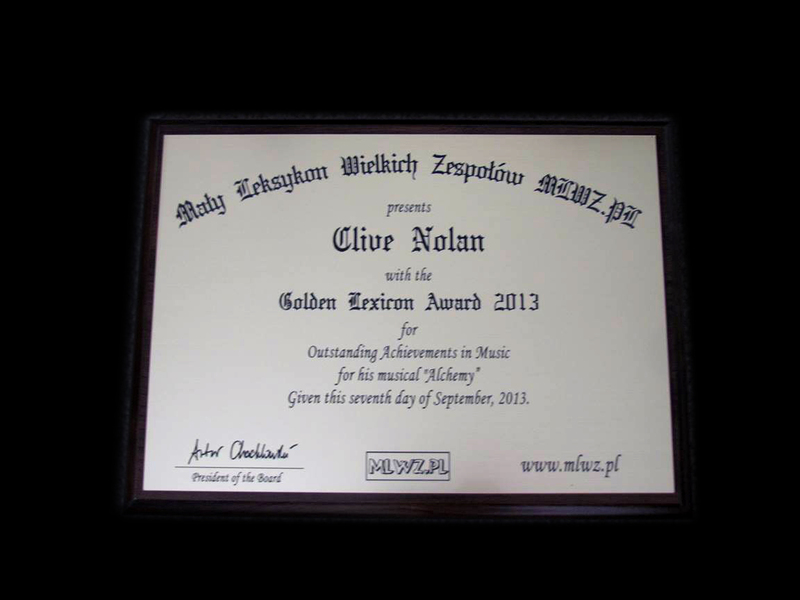 Moreover, on the closing night of the Cheltenham shows, Clive was presented with the MLWZ Golden Lexicon Award 2013 for Outstanding Achievements in Music for his musical 'Alchemy', which crowned three extremely intensive years of work on the musical. Congratulations, Clive! Well deserved! Clive Nolan: "Winning this achievement award was a real surprise to me and a wonderful conclusion to the 'Alchemy' week. It is already on my wall and I am very proud of it. Thank you!" Clive Nolan is working with a famous comic book and graphic novel artist Mark Buckingham to develop imagery for the CD/DVD and for the show, as well as a graphic novel version of the story, as part of the 'Alchemy' project. The images of the graphic characters will be based on the actual 'Alchemy' cast. Mark Buckingham has been working in comics for almost 25 years, on numerous titles, including 'Miracleman', 'Sandman' and 'Death', all with writer Neil Gaiman, as well as significant runs on other key comics such as 'Batman', 'Spider-man' and 'Hellblazer'. For the past ten years Mark has been the regular artist on Fables for DC Comics, working with its writer and creator Bill Willingham, for which they have earned numerous comic industry awards. He has also illustrated 'Willingham's Down the Mysterly River' prose novel released last summer by Tor books. 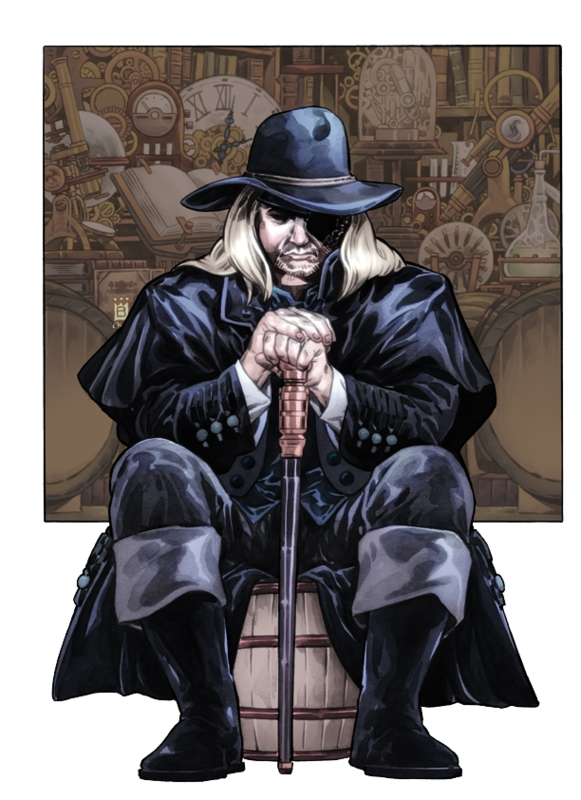 In addition Mark is also the regular cover artist on IDW's 'Doctor Who' comic and is recently worked with Neil Gaiman on a comic strip for 'The Brilliant Book of Doctor Who 2012' for BBC Books. Progressive Rock Celebrities in Cheltenham! The forthcoming 'Alchemy' shows in Cheltenham, UK (September 5th, 6th, 7th) will be a feast not only for the theatre-goers. 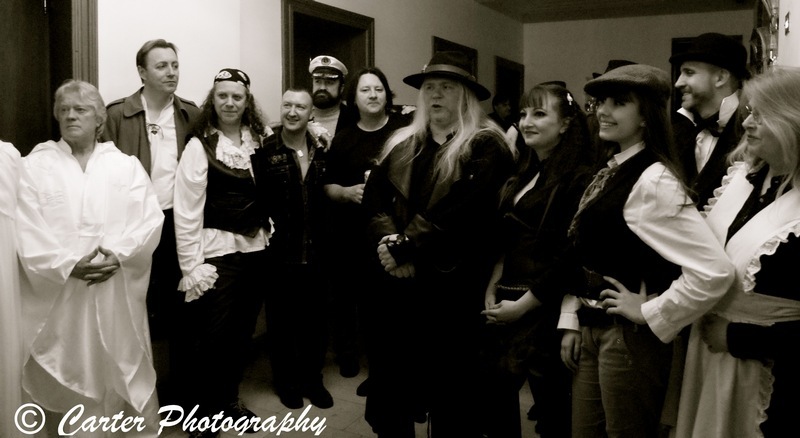 Among the Caamora Theatre Company team, an association of artists formed to perform Clive's musicals, a number of the renown progressive rock names can be found too. In some of the principal roles we will see Andy Sears (ex-Twelfth Night), David Clifford (Red Jasper) and Clive Nolan himself. The role of Thomas Anzeray at the Saturday matinee show will be performed by Paul Manzi (Arena). 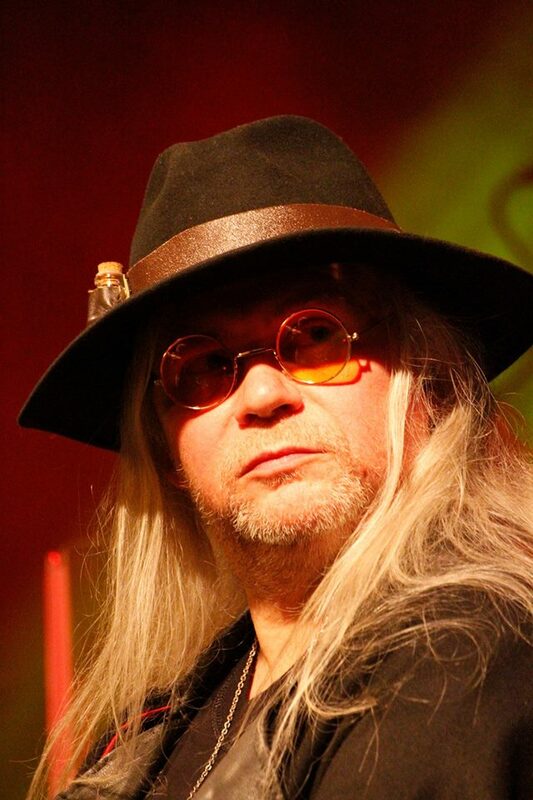 Moreover, in the orchestra pit we will find more prog-world celebrities: Scott Higham (Pendragon), Mark Westwood (Shadowland) and Claudio Momberg (Seti, Taurus). Chris Lewis, formerly involved with The Enid, and Agnieszka Swita, a lead vocalist for Clive's rock opera 'She', will re-appear on the Playhouse stage in the Cheltenham production of 'Alchemy' too.